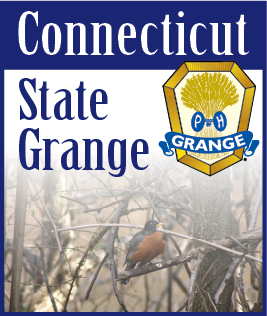 We are halfway through the year and we’ve already heard of several new and imaginative community service projects being planned or begun by Connecticut granges. Creating connections with the community is very important in making the Grange known to others in both rural and suburban areas. We need to put our best foot forward in presenting ourselves if we expect our granges to grow. When the community sees us working to make it a better place to live, our neighbors want to be part of us. You might say that as grangers we win twice. Once for the good feeling of making ours a better community and second for the great promotion we get for our organization. For those who need more help there are opportunities in every community to partner with other organizations - Boy Scouts, Girl Scouts, schools, churches, fire departments and other civic and fraternal organizations. They may be in the same situation and need assistance with their projects. How many times have we heard, “we used to do those things but we are too old to do them anymore”? Do you go to a senior center? Can you volunteer your time there? Can you collect toiletries for veterans or shelters? Part of the CWA/Family Activities program is collecting canned goods. They are also asking for donations to the “Kid’s Fund” which is donating small denominational gift cards from Wal-Mart, McDonald’s, etc. Put this toward your grange’s community service. Should Auld Acquaintance in the Lecturer’s program counts towards community service. The Juniors are collecting items for pets and collecting children’s books - lend them a hand. Take part in growing the butternut squash which the Ag Committee has provided. Can’t grow seeds yourself? Ask the community to help out. They would like to take part if they realize this project helps out the Ct Food Banks. Again, a great tool in gaining new members, so publicize this project. Are you involved in the Dictionary Project? So many possibilities! Your Community Service Chairpersons are not only here to collect reports - we will help you with ideas and advice to help you achieve success. We look forward to seeing your reports and your imaginative ways of creating community connections.